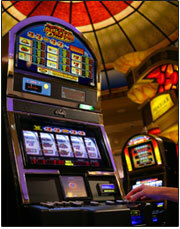 The slot history looks back about 115 years ago, when the first gambling machines were invented. Since then slot machines have gained vast popularity and with the development of modern technology new variations of slots were introduced in casinos all over the world. Slot history began when the first prototype of the slot machine as we know it now was created in New York in 1891 by Sittman and Pitt. It was based on the card game of poker and contained 5 drums (reels) with pictures of 50 card faces. By inserting the coin and pulling the lever the players spun the drums. Depending on the combination of cards in a hand that came out when the drums stopped, the player either lost or won. The machine had no coin payout system. Instead it offered prizes to the winners, like free cigars, drinks or meals. The machine had three reels with 5 symbols imprinted on each of them. The players pulled the lever and the reels spun stopping at a certain combination of symbols. Three symbols in one slot machine payline made the winning combination. Three Liberty Bells brought jackpot - the highest payout of 10 nickels. 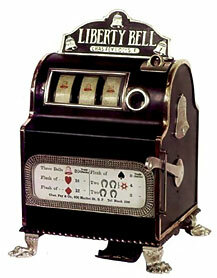 The popularity of Liberty bell slot machine resulted in the invention of various copies. The most famous of these was Operator Bell by Mills Novelty Company created in 1910. It introduced fruit symbols that are common in most modern slots. Early 1900s are marked by the toughening of Anti-Gambling laws and further prohibition of gambling. Nevertheless slot history didn't stop and the machine didn't lose its popularity, even though it had to remain in the shade for more than two decades. First slots with electric motors were introduced in 1930s. They were named "Paces Races" and were based on horse races. But the electric motor here only started up the fully pneumatic system with bellows. First fully electromechanical slots were the "Money Honey" machines invented in 1963 by Bally Manufacturing offering bottomless hoppers and automatic payout system. 21 slot machines by Nevada Electronics introduced in 1964 offered chairs for 2 to 4 players. It now became impossible to cheat the machine using microchips. The size of the machines reduced and the side level became a rudiment. New machines also offered different sound and visual effects. 1970s were marked by the further development of technologies which defined a new age in slot history. New video slot machines were invented. At first they didn't gain much popularity due to the mistrust of the players who could not see the spinning reels. But in the early 1980s International game Technology introduced new video progressive slots called "Megabucks" that became overwhelmingly popular as it offered an opportunity to get huge progressive jackpot due to the fact that all "Megabucks" machines in each casino were interlinked. Nowadays slot machines come in different variations that may suit different tastes - from hi-tech modern slots based on popular TV shows or movie and cartoon characters to retro-style slot machines resembling the classical Liberty Bell.